Mama Love: Juil: Earthing Sandals & Shoes - Stay Grounded Review + GIVEAWAY! Babyliss Pro: Not your Mama's Hot Rollers! Protein Bakery Review + Giveaway! 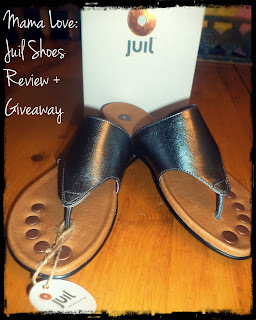 Juil: Earthing Sandals & Shoes - Stay Grounded Review + GIVEAWAY! I was recently contacted about doing a review of a pair of Juil Shoes, and Let me just say that I am beyond excited to be sharing Juil with you today! 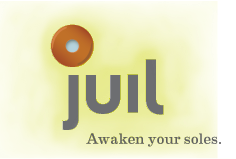 “Juil footwear cleanses your body of free radicals, based on a concept known as earthing or grounding. Whereas most footwear insulates your body from making a connection with the earth, the copper "dots" in Juil earthing shoes act as a conduit between your body and the Earth, allowing you to stay truly connected and balanced. Our mission is very simple – we want you to look better, feel better and be better. This all starts from the ground up, wearing our unique and remarkable styles that provide you with your own special connection. At first I was skeptical that something so simple could work but after reading as much as I could find on grounding, it seemed at least possible that it would work. Basically, the theory is that our bodies are meant to come into contact with the Earth (a “grounding” force) on a regular basis. Positive electrons in the form of free radicals can build up in our bodies and direct contact with the ground balances this out as it is a negative grounding charge. Our bodies and cells have electrical energy, and especially with the high prevalence of Electromagnetic waves, Wi-Fi and mobile phone waves and etc, most of us have a high amounts built up in our bodies. Throughout history, humans have spent time outdoors much more than we do now, in modern time and have been in direct contact with the soil. From walking on the ground barefoot, to gardening and etc humans have always touched the earth until more recent modern times. Now, we live in houses, wear rubber shoes, are exposed to EMFs daily and don’t often come into direct contact with the ground. Have you ever noticed that you sleep better on a beach vacation after walking in the sand or being in the ocean? The sand and ocean water and both naturally conductive materials and both help ground the body and remove excess positive electrons. For the same basic reason that we ground electrical outlets to avoid the build up of excess positive charge, our bodies need the same ground effect, Which Juil Shoes Provide! I was able to pick a pair of Shoes from Juil, which was incredibly hard they are all so beautiful, but i finally decided on the Brio Sandals in Pewter! First off let me Rave about their packaging, the shoe box is adorable, sturdy slide out fun colors definitely a keeper, then you also get a beautiful mat bag! The Brio Sandals are what I like to call a “dressier thong sandal”, (now I’m sure there is a correct name for them but that’s how I describe them) that come nine beautiful colors. I cannot stress how comfortable these are and I didn’t feel the copper conduits at all. They stay on my feet well and they look fabulous: I can wear these lovely shoes with a casual outfit or even throw them on with a dress and they look great. I really feel like the shoes did their job, I honestly was very skeptical of them actually working but I do feel less stressed, more energized and like I have slept better the past week, I usually toss and turn and wake up about 10 times a night! Not to mention my feet feel wonderful! I would suggest these Juil Sandals to anyone looking for a stylish shoe and they come with the added benefit of grounding. Want to Win a Pair of Juil Shoes? Of course you do! Just follow the link HERE to Mama Love's page for the Juil Shoes Giveaway!! !